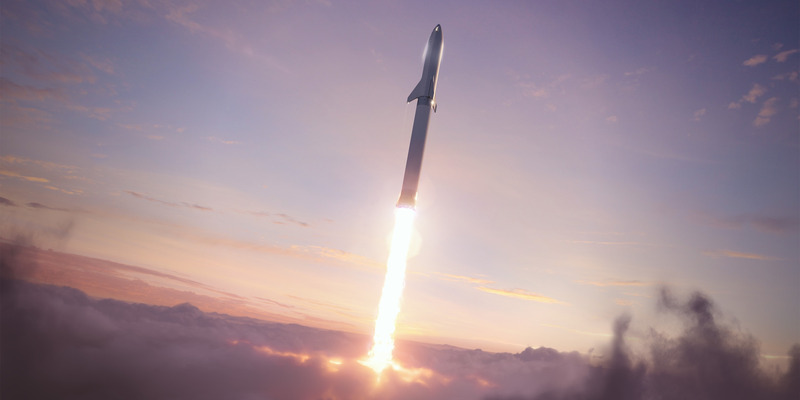 SpaceXAn illustration of SpaceX’s Big Falcon Rocket, or BFR, launching through Earth’s clouds and toward space. Elon Musk’s aerospace company, SpaceX, is building a gigantic rocketship to reach Mars. In SpaceX’s “final’ design, the two-part launch system stands about 387 feet tall and 30 feet in diameter. Elon Musk’s rocket company, SpaceX, is working on something big – really big. Musk revealed what he described as the final BFR design in September. It’s made of two giant stages: a fully reusable rocket booster on the bottom, and a fully reusable spaceship on top. The first crewed mission is penciled in for 2023 and is expected to blast a Japanese billionaire and a group of artists around the moon. The BFR’s dimensions and presumed capabilities are impressive – so much so that quite a few people in the aerospace industry are puzzled by how it will be done. They also wonder if it can be built successfully by a private company on a budget of about $US2-10 billion. That’s Musk’s latest estimate for how much the development of BFR will cost; the sum is actually a relative pittance compared to what NASA is paying for its new (and not reusable) Space Launch System. Next to the rendering of BFR shown below, you’ll see a series of familiar objects at the rocket’s base. (Some are so small that you may have to scroll down a bit.) Toggle through the 20 comparisons by clicking “next” or “back” to get a sense of hte rocket’s scale.